Eye spy with my little eye… a colourful little slug sitting on a rock! When you first start diving the sight of different coloured fish swimming all around you is enough to take your breath away and distract you for many hours. I never tire of swimming amongst the fish but I also love the small surprises that are hidden in our oceans. The more comfortable we become in the water the more that we are able to concentrate on our surroundings and we get to know the environment that we are privileged enough to visit and whilst nudibranchs are often brightly coloured they vary in size from a couple of mm to over half a meter! I have seen tiny nudibranchs whilst diving in the Bahamas that were less than the size of the white tip on my pinky finger to ones that are over 15cms in the chilly waters of British Columbia! Most people can spot a big shark cruising by but not everyone has the eye to find a nudibranch. So what exactly is a nudibranch? It is in the mollusc group – sharing characteristics with octopus, squid, clams and snails. This group falls into 3 major categories cephlapods (octopus), bivalves (clams) and gastropods (slugs and snails). The Gastropods are divided into 3 sub-classes: Prosobranchia - sea snails with shells, Opisthobranchia - sea slugs, and Pulmonata - land snails and slugs. Opisthobranch molluscs are gastropods that have a reduced shell or no shell at all in their adult form. They belong to this sub-class therefore they are all sea slugs, however not all sea slugs are nudibranchs! 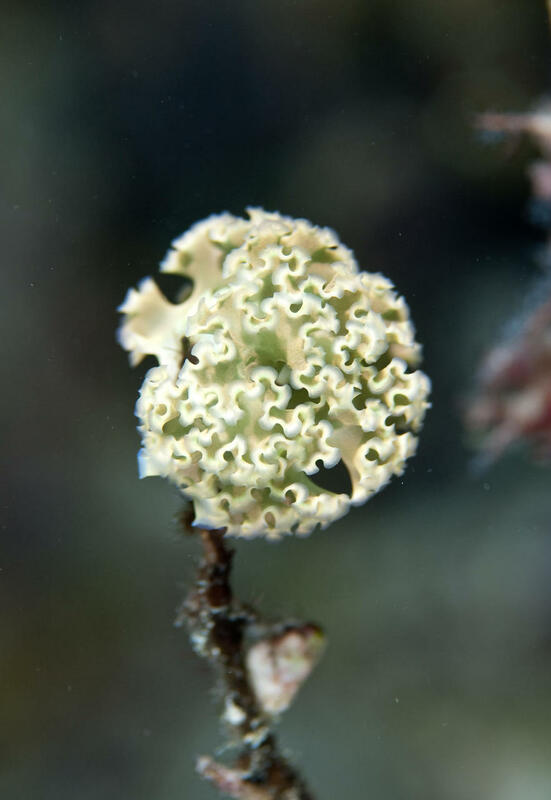 Scientists have further divided the Opisthobranch into 8 different orders, 2 examples of which are nudibranchs and sea hares. Confused? If in doubt call the little critter a sea slug! Nudibranch basically means naked gill so these creatures have exposed frilly appendages on their back through which they breath. They also have Rhinopores on their head which can detect touch, taste and smell. All this means they get transported from looking like the common garden slug which we see eating our lettuce to being this colourful little creature that we hope to find on our every dive. There are many different types of nudibranch but we can subdivide them into dorid and eolid nudibranchs. Dorids breathe through gills that are located on their back end. Eolids have outgrowths on the upper surfaces of their bodies called 'cerata'. These appendages increase their body surface area and aid in respiration. Some nudibranchs have cerata that sting and they can also be an effective way of deterring predators. Most of the nudibranchs that we see here in the Sea of Cortez are dorids. My favourite thing about nudibranchs is that they don’t reveal all of their secrets to you at first glance. They look like they are slowly moseying around the rocks and reef but what they are actually doing is eating. They spend most of their life eating with only a few hours a day inactive. The reason for this is because they are carnivores and eat a range of different sponges, barnacles, eggs and other sea slugs but they only move an average of 10m per day so they take a long time to go fid their food. Nudibranchs have a radula which is a bit like a grinding plate that helps them to breakdown their food. 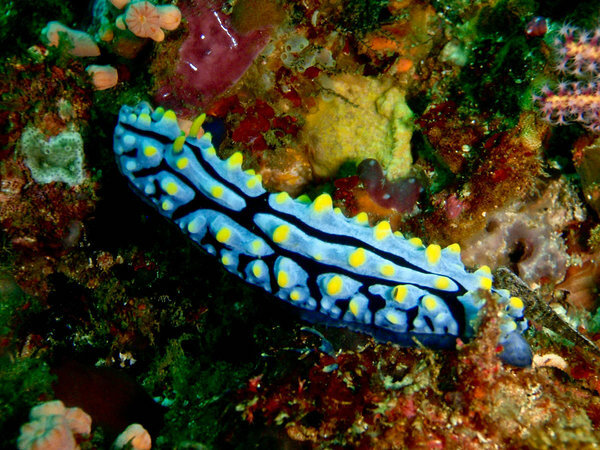 Many nudibranchs are colourful because they take on the colour of their food. Some some of this is colourful sponges and sometimes it is algae. 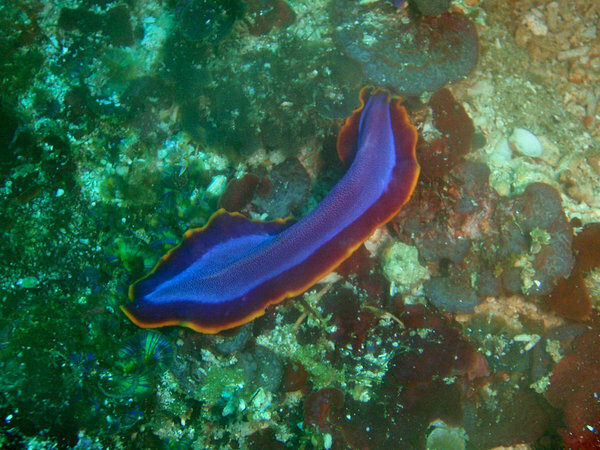 Here in the Sea of Cortez we get a particular nudibranch, usually found in shallow water, called a Diomedes' sapsucker, that eats algae. It stores the chloroplasts from the algae in specialist cells on its back to then also gain energy through photosynthesis. This type of behavior is called kleptoplasty because it is stolen items. Other types of nudibranchs eat jellyfish or coral and store their stinging cells to use as a defense mechanism, mainly the eolids. Eolid nudibranchs have developed a stinging strategy that temporarily incapacitates the predator. They can swallow whole the stinging cells located inside an anemone's tentacles and store them in special sacs in the tips of their cerata. These stinging weapons are used to catch food as well as for defense. Nudibranchs don’t have many predators and the only creatures likely to disturb them are other nudibranchs, turtles, some crabs and humans. Over years of evolution they have lost their protective shell and so rely on other forms of protection and defense to deter would-be predators. One form of protection is camouflage to blend in with the background and avoid detection. Another is to exhibit bright or striking colours as a warning to predators that they are toxic. Some nudibranchs can emit chemical odours to deter predators. One of my favourite nudis is the Hypselodoris ghiselini nudibranch because it looks like a little bunny rabbit hopping around the reef. On day dives the most common nudibranch that I see is Tambja eliora, sometimes called the slimy sea slug and also the dorid tiger or sea tiger. At night it is a different matter, then the big guys come out! One of my favourite dives at night is Candelero as it is swarming with California Sea Hares – they don’t look particularly exotic but the numbers and behavior are great to watch! Nudibranchs are hermaphrodites, meaning that they carry both male and female reproductive organs; however they cannot self fertilize so they do need to find a mate. They lay their eggs in a beautiful patterns. Nudibranchs are the specialist subject of many a macro photographer, I don’t have a good enough camera set up to be able to capture them particularly well. Unfortunately the GoPro, whilst great for wide angle, is not the best for small closeups. Many of the photos this week are my own but unfortunately not from the Sea of Cortez but a dive trip to Indonesia a few years ago. A great site I found for photos of the nudibranchs found in the Sea of Cortez is https://www.ashunderwater.com/blog/sea-of-cortez-nudibranchs/ On this site you get to see some of the amazing details that can only been seen either with a magnifying glass or through a macro lens – simply stunning. Whether you are an avid photographer or not, come diving with me and El Duque Adventures in the Sea of Cortez and I will help us find the little creatures.